I’ve been decorating cookies since 1998. The first ten of those years at a shop for 8-plus hours a day. As a result of all that practice, at home, I can whip them out relatively quickly. Relatively. 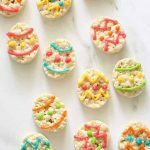 The whole process of making dough, chilling it, rolling it out, cutting it out, baking it, making icing, coloring the icing, filling decorating bags, decorating and letting dry is inherently cumbersome. Even with my relative speed I kind of groan every time I have to make cookies, because it takes forever. And I have so much stuff to do. Because I’m so busy and no one understands. But I digress… On to cookie decorating. Let’s make all of our lives easier, shall we? 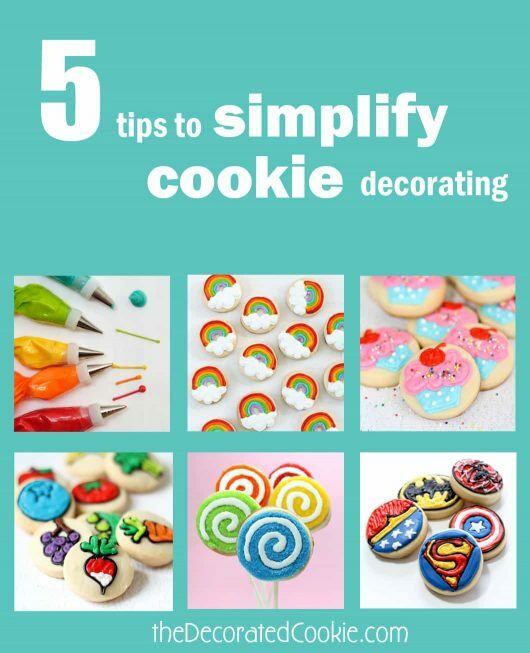 Here are a few tips on easy cookie decorating to speed things along. 1. 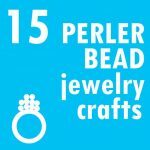 Use disposable decorating bags. Instead of washing out bottles, I use disposable decorating bags. These are just all around easier to use, I find. 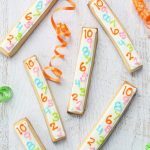 And I use them for a lot more than cookie icing (I stuff pasta, fill cupcake liners, make pancakes… and I use them all the time to make candy pops, like these sea animal candy pops or chocolate bacon pops). I buy them by the 100s. To decorate cookies, insert a coupler (without the ring) into the bag. Snip the tip of the bag below the edge of the coupler. Fit a tip on the coupler (around the bag) and screw the ring on the coupler. 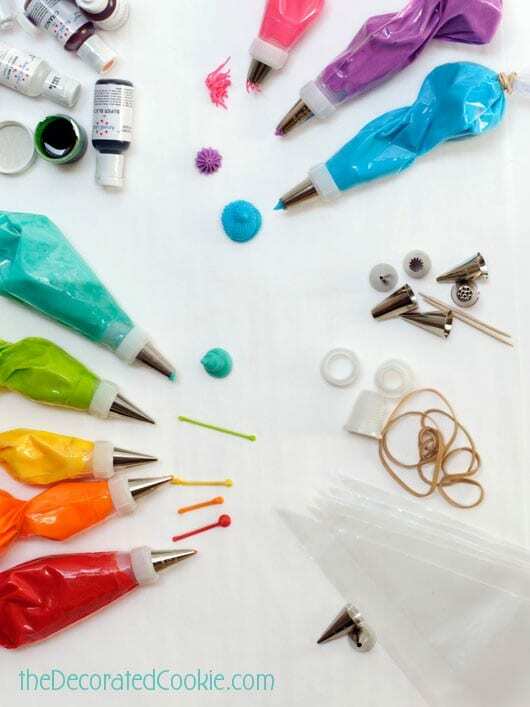 Fill with royal icing and close the bags tightly with rubber bands. Pipe away! When you’re done, cut out the couplers to re-use and toss the bags. To flood cookies, I fill an empty bag (no coupler) with thinned icing and just snip a bit off of the tip, then pipe to flood the icing. By the way, the picture above is from my book, Sugarlicious. I use sprinkles liberally in cookie decorating. Why? They cover all your imperfections. Rather than create two consistencies of icing (one thicker one for outlining and one thinner one for filling in), I often just create the thicker consistency. 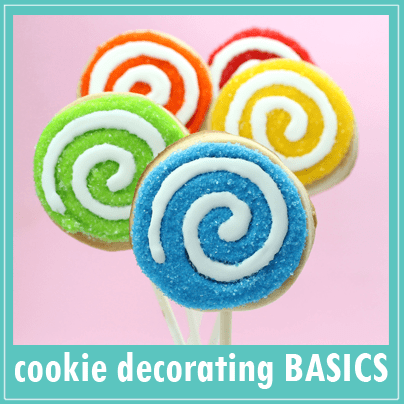 Then, I pipe to fill the cookie and immediately coat the icing with sprinkles of the same color. Sparkle and easy all in one. 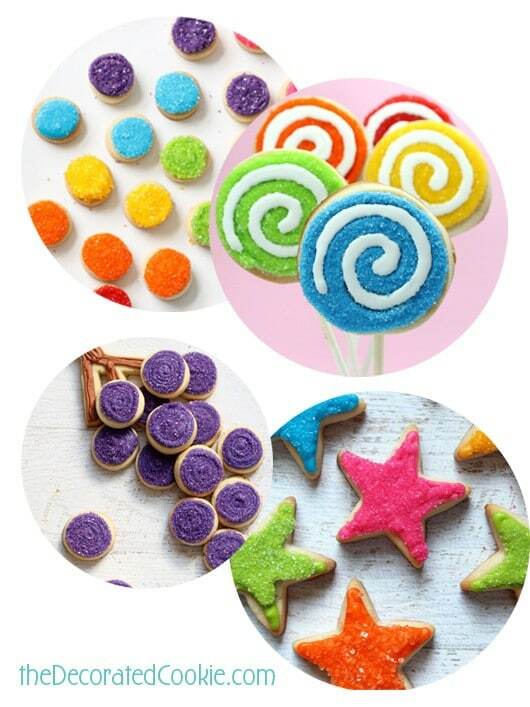 Here are a few examples of how this is done: Make sparkly rainbow cookie bites, grape cookies, swirly cookie pops, and star cookies. 3. Break things up and make stuff ahead. 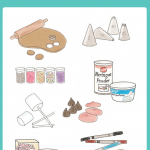 Making and coloring icing, preparing dough, cutting out and baking cookies and decorating can take many hours. I usually make icing, color it, and prepare my decorating bags up to a week before I cut out and bake my cookies. 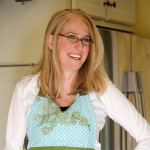 Making royal icing with meringue powder instead of egg whites means it can last at room temperature for several weeks. 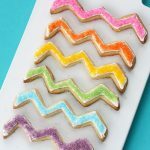 You can also freeze cut-out, undecorated cookies. Stack in freezer-safe ziplocs and let thaw in the bags at room temperature before decorating. I also often freeze my decorated cookies. let them dry overnight. Place in a single layer in gallon-size ziplocs and freeze. To thaw, let the cookies thaw completely in the ziplock bags at room temperature. Do not remove from the bags until they are fully thawed. 4. Circle cutters are your friend. I love my Ateco set of circle cutters. When in doubt, I go for an easy design using a circle shape. Not only does it look better (I think), but it saves hours in decorating. For example, instead of making 20 character cookies, why not choose one element of the character (such as a pattern on their clothing) and just make circles? 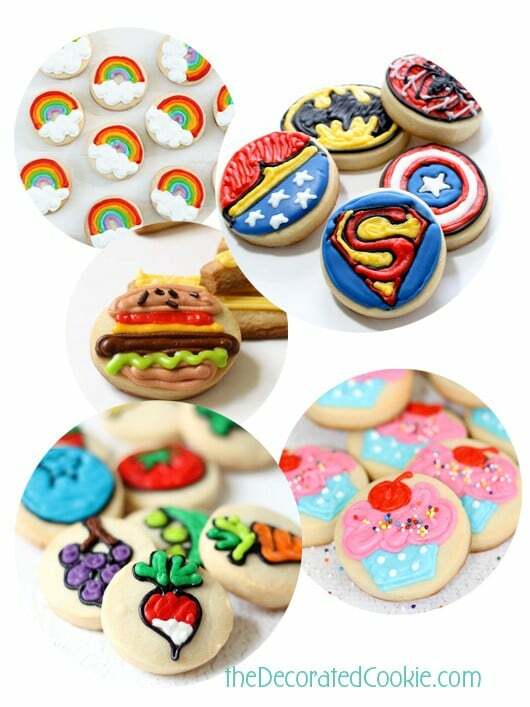 Here are some examples of where I used circles: Cupcake cookies, fruit and veggie cookies, burger and fries cookies, rainbow cookies, and superhero cookies. I (clearly) don’t worry about being perfect. If you see my lines a bit? Eh, who cares? 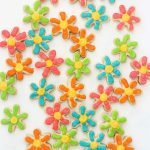 Often, instead of making two consistencies of icing–one thick to outline and one thin to flood–I just use an in-between consistency to outline and fill. Life is so much easier that way. Here is an example of where I just pipe to fill. You can see my lines (and you can see me totally unconcerned by this): Birthday candle cookies. 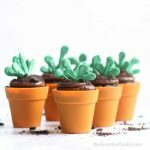 You may also use the design to work in your favor to only use one consistency of icing. 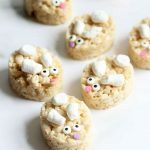 I do this in these “chaos” letter cookies or these monster cookies.